UNOM Results 2019 : Madras University Results April 2019 for UG PG BA, B.Sc, B.Com, MBA, MCA, M.A, M.SC, M.Com will be released at unom.ac.in. The University of Madras – UNOM results of various UG and PG Courses will be declared in June 2019. Hence all the candidates those who have appeared for their Odd Semester 1st, 2nd, 3rd, 4th, 5th, 6th Exams April months can check their results from UNOM official website, www.unom.ac.in. The UNOM has conducted various examinations concerned with B.Sc, BCA, BBA, BA, B.Com, and other PG Courses in the month of April. Students pursuing under the Madras University have successfully completed their semester examinations are desperate to know their results. The wait is over now and it’s time to know the results. Candidates can click the direct link at below to access their results of April 2019 examinations. 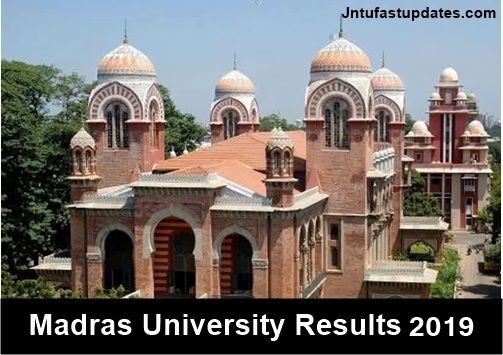 Madras University Results: The Unom result 2019 will be released in the official website Soon. Students can Check University of Madras Website for result. Candidates also allowed to apply for the reconsideration and revaluation before last date mentioned below. Madras University (UNOM) Results April 2019 : The University of Madras is one of the oldest educational boards of India that was been established in the year of 1857. It was popularly known as UNOM. The Board offers various UG and PG courses for aspirants seeking bright career. The University is well authorized in maintaining the quality of education, conducting the examinations and releasing the prompt results to students. The UNOM works based on semester system. Annually it conducts the examinations twice in a year, April / May and Nov /Dec months. Huge number of students were obtaining their valuable education under this board. Also the success rate of UNOM is very high. Students who have completed their sem examinations in april months of last year can get ready to download their results. The Board has to be announced the result release date is in May/June 2019. Hence all the students can stay connected with the University official page to check their BA, B.Sc, B.Com, MBA, MCA, M.A, M.SC, M.Com Results, after the results have been uploaded. REVALUATION: Candidates admitted from the academic year 2019 for M.A./M.Sc/M.Com/ M.S.W./M.A.[LM]/MBA/M.A.[HRM]/M.Sc.[IT]/M.Sc. [CS] courses, from 2013-2014 for M.Sc. (CST), M.A. (Natya) (Five year integrated) course and from 2015-2016 for MCA, MBA (part-time) and UG degree courses can apply for revaluation through online from —–(www.unom.ac.in) The computer generated application duly signed by the candidate should be submitted along with a demand draft for Rs.1000/- per subject drawn in favour of “The Registrar, University of Madras” on or before — (or) those who are willing to pay the revaluation fee through online mode, the RV ID number is a mandatory one to be entered in the column provided for making online payment. Due to the heavy traffic hitting at once, the survey might be busy to get the results faster. In case if happen so, students need not to get panic. Here we are suggesting the other websites to download the UNOM UG & PG Results 2019. Students can visit any of the website and can access their results. Details will be Update Soon. Visit the official website of www.UNOM.ac.in or simply click on the UNOM Result 2019 link from above. Any idea when mphil results will be announced??? When the result will come? Waiting for that moment..